Humans evolved to be omnivores. We'll eat anything we can get our hands on - fruit, vegetables, beans, grains, meat - and we've invented innumerable ways to cultivate and refine those basic ingredients, particularly in the last 10,000 years or so since the agricultural revolution. But diet in the past was limited, primarily by geography but also by social class or culture. Before the New World was discovered, Italian food had no tomatoes. Before the industrialization of food production, many items we think of as dirt cheap today, like salt, were too expensive for the poor to purchase. If you didn't live on the coast, you probably weren't eating seafood. When we talk about ancient diets, then, we're looking primarily at commonalities - what the average person was eating - while at the same time understanding that omnivores make for a dietarily heterogeneous population. There is no singular "American" diet, but we can agree that most of us likely consume a large amount of corn-based products, which are cheap and ubiquitous in the form of corn syrup, tortilla chips, popcorn, etc. This reliance on corn, a crop native to the New World, means that the average American diet differs from the average European, African, or Asian diet. Biochemically, we can see this difference in carbon isotopes, and we can show that their value increased following the transition to maize agriculture in the Americas (see, for example, Tykot 2006). My carbon isotope value is almost certainly higher than that of most contemporary Europeans. 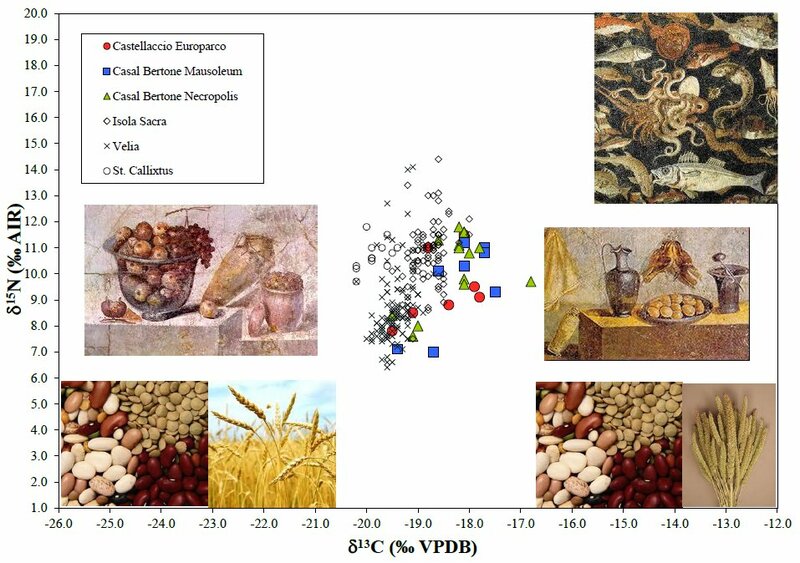 Similarly, there is no singular "Roman" diet, particularly in the Empire when goods were moving around at astounding rates, although researchers agree that a heck of a lot of wheat was consumed by all social classes and that olives and olive oil contributed a number of calories and fat to most people's diets. Ancient historical sources also seem to agree that no one really liked barley and that millet was only consumed in times of struggle, as both of these grains make inferior bread compared to wheat (Garnsey 1988). Yet dried millet tended to keep longer than other grains, making it good for storage along with dry legumes like chickpeas, lupin beans, and lentils, the latter another food that was most often consumed in times of shortage. Ordinary Romans - that is, small farmers, peasants, and rural slaves who made up the majority of the ancient Italian population - likely got a large chunk of their diet from their non-cash crops like millet, legumes, and turnips, at least based on what writers such as Columella, Strabo, and Galen tell us (Garnsey 1988). Their daily diet would have been a far cry from the exotic foodstuffs found at elite banquets. But, as Horace writes, "Ieiunus raro stomachus volgaria temnit" (Satires II, 2, xxxviii). A hungry stomach rarely scorns plain food. The carbon axis shows that the people living in the Roman suburbs and along the coast were eating mostly wheat and barley (C3 foods, which have lower carbon isotope values) rather than millet (C4 food, which has a much higher carbon isotope value, starting around -13.0 permil). But their carbon values are higher than a purely C3-based diet, so those could be affected by marine resources and/or consumption of animals that were foddered on millet. The nitrogen axis shows that most people were eating a terrestrial, fairly omnivorous diet, with the coastal population of Velia eating a surprisingly little amount of fish. The pure vegetarians would be at the low end of the N axis, and the pure pescatarians would be at the high end (along with breastfeeding infants). So what is the recipe for a Roman diet? Well, it's a little bit of everything, really. But you wouldn't know that from reading the half dozen or so cookbooks that contemporary authors have written to approximate Roman cuisine. For example, my copy of A Taste of Ancient Rome, while it has much to recommend it, has just two recipes that include lentils and none that include millet. In his Historia Naturalis, Pliny notes that Campania in particular is full of millet and that peasants often mixed bean-meal (lomentum) with millet flour. Since cooking and chemistry are two sides of the same coin, I decided to remedy this omission by creating an historically-accurate dish that a Roman peasant might have eaten but also one that would show up isotopically in the skeleton (if eaten in large enough quantities). Simmer 1/2 cup of lentils in 1 cup of water for 20 minutes, or until soft. Separately, simmer 1/2 cup of millet in 1 cup of water for 15 minutes. Put aside to cool. Mince 1/2 cup of onion, 1/4 cup of parsley, 2 tablespoons of fresh mint, and 1 clove of garlic. Add to grains. In a separate bowl, mix 1/4 cup of lemon juice, 1 tablespoon of red wine vinegar, and 1 teaspoon salt. Pour over the salad and toss well. Top with freshly cracked pepper. * See alternative recipe in the comments. Mmmmm, tastes like high carbon and low nitrogen! I served myself up a bunch of this salad for lunch, and I garnished it with some other Roman staples to make it a balanced meal: a bit of cheese, olives, and dried apricots. It's delicious. Kind of like tahbouli, which coincidentally is my go-to dish on 90-degree weeks like this in North Carolina. On Monday, I'll be serving this to my friend Sarah Bond's Roman history class at Washington & Lee, while I tell them about the information skeletons can give us that histories can't. Let's hope the students like it (and that it helps them remember something about isotopes and ancient diets)! Garnsey P. 1988. Famine and Food Supply in the Graeco-Roman World. Cambridge University Press. Giacosa I.G. 1992. A Taste of Ancient Rome. University of Chicago Press. 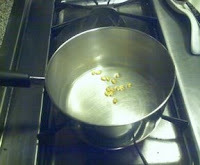 And why boil the millet and lentils in separate pots, when a single pot will do? This saves on dish cleaning, water and cooking fuel. So, I can't find much on vinegar, but considering they were fermenting grapes for wine, I don't see why they wouldn't have had easy access to vinegar (maybe not balsamic, which doesn't seem to show up in the histories until 11th century, but red wine or apple cider type vinegar). The question may be whether they saw vinegar as a comestible or not - it seems they might have just seen it as spoilt wine and not eaten it often. They did have pepper, as well as a number of other spices. Apicius concludes numerous recipes with "sprinkle with pepper and serve," and there is a growing body of evidence of peppercorns from archaeological sites (Cool, 2006, Eating and Drinking in Roman Britain, although the pepper reference is to the entire Empire). And the reason I boiled them in separate pots is because I wasn't sure how long the lentils would cook (they ended up taking longer than the millet) and because I wanted to add salt and butter to the millet (but salt in particular makes lentils shrivel if you add it while cooking). But, yes, if I make it again, I'll tweak the recipe to cook them both in the same pot! I Googled "ancient Rome and vinegar" and found references to posca, a drink made with vinegar, water and herbs, and several recipes for cabbage and vinegar and celery and vinegar. I can't imagine that someone didn't find the preservative properties of vinegar, as it would have been cheaper than preserving in salt. 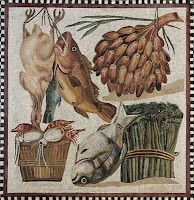 Also, much of Roman food would have used garum, a fish sauce. There were garum factories all over the Roman empire, and it was shipped to the provinces in quantity. Try a dash of Worcestershire sauce instead. Soft cheeses mixed with herbs were popular, too. That's what I found out about vinegar too. I didn't add garum (or a garum-ish condiment like Thai fish sauce) because, well, I don't like it. Feel free to drown yours in it, though. That would definitely be a Roman thing to do! I really enjoyed this post and definitely want to try this Roman recipe! I love how educational and still fun your posts are! Definitely inspiring for me, as an undergraduate student in anthropology, to see a professional anthropologist using social media to publish in such a friendly and open way! Thanks, MsSecAF! If you make any modifications to the recipe that make it more delicious, please let me know. The Romans certainly used vinegar. In fact, if you want to make a basic Roman meal, vinegar, honey, pepper and fish sauce (then garum, today the Asian kind) will take you a long way towards it. They especially liked sweet and sour combos like vinegar and honey. Anthimus' (essentially Roman) combinations for a Frankish king are full of these. Posca was probably the "vinegar" given to Christ on the Cross. Rather than the cruel gesture this once seemed to be, it more likely was a good thirst-quencher. 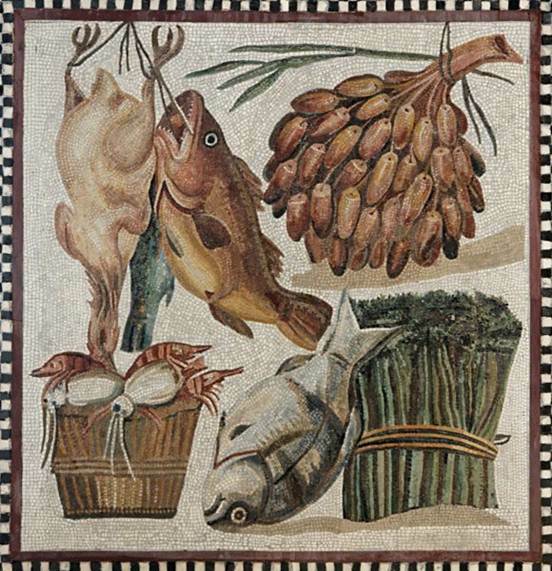 The Romans loved pork and certain seafood, such as mullet. Supposedly though they were once more vegetarian than not. Of course the modern cookbooks of Ancient Roman cuisine don't include recipes like this because they're heavily reliant on literary sources, which of course would be biased towards fancy food. Obviously wine vinegar (if not balsamic,) and pepper are extremely Roman. The only problem is the lemon juice. There is some evidence the Romans had heard of edible citrons by some point, but they don't seem to be food ingredient until much later. And certainly not the lentil-millet eating Roman peasants you envision. Thanks for the Latin/Greek lesson, JDM! "Bonum appetitionum" was meant to be tongue-in-cheek, but I didn't know what (if anything) the Romans would have said. Orexin makes a lot of sense. "Lemons (C. Limon) are possibly to be recognized in Roman wall paintings of the early Empire (see Jashemski), and in written sources of the second century AD, which discuss the fact that the kitrion was formerly not eaten but now is. The evidence is inconclusive, and some believe that the lemon was first introduced to the Mediterranean under Arab influence." To be fair, I haven't looked at the sources, primary or secondary, which he cites. But my impression is that a) even once Lemons were around they weren't used as an ingredient b) they weren't grown in Italy. But even if this is a strong impression, it is an impression, and you are surely more familiar with the physical evidence than I am. Do you know something I don't? And it is a shame that blithely substituting vinegar for lemon juice doesn't tend to work, but you could always try cutting it with wine, fish sauce, honey, or the like. You might try some of the simple mixtures mentioned by Apicius as vegetable dressings. The one given in Taste of Ancient Rome for hard-boiled eggs is amazing, but unfortunately contains asafoetida, which seems unlikely for your peasants. By the way, I do a "Cena Romana" every year for about fourty people, and I *always* include lentils: they are perfect for any guests who happen to be vegetarian, and the elite recipes that are attested for them are just fantastic! Lastly, I see you know Donald Haggis. Please send him my regards! Justin - I'm sure you're right about lemons. Everything I've seen has said that the Romans had lemons (from India originally?) but didn't use them or reserved them for the elite. I looked through the palaeobotanical literature but didn't find anything on, say, lemon pips (seeds?). But palaeobotany is a woefully under-researched field in the Roman world, so perhaps in a few years' time, we'll learn a lot more about the fruits, veggies, and grains that people were eating. So, in light of the lemon discussion, I tweaked the recipe and made it for lunch (I seriously cannot get enough of lentils + millet). Boil 2 cups of water. Add 1/2 cup of lentils and 1/2 cup of millet. Cook 15-20 minutes, or until tender. Add more water if necessary. While that's cooking, mince 1/2 cup of onion, 1/4 cup of parsley, and 2 tbsp of mint. Mince or press a clove of garlic. For the dressing, mix 1/3 c apple juice and 2 tbsp vinegar. 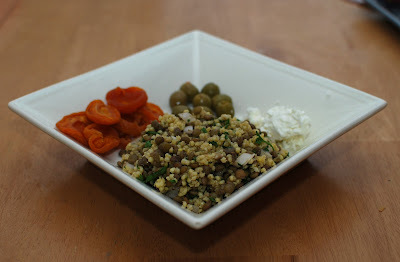 Toss lentils, millet, chopped veg and herbs, and dressing. Salt and pepper to taste. Serve at room temperature, ideally with some delicious, tangy cheese. Yes, precisely, "Bonam Appetitionem" would be an accusative of exclamation... or alternatively you could imagine it's the object of an unspoken verb, such as "tibi exopto..." 'I wish you...', but either way it amounts to essentially the same thing. Note that you could say exactly the same thing about "Orexin!" I don't have palaeobotany, nor a palaeobotanist, myself. It is an unfortunate, and gaping hole in my knowledge. So I'm glad you knew where to look this up. Apple juice is a clever substitute. It's not exactly common in Roman cooking, but it is used, for instance, in Columella's recipe (http://www.forumromanum.org/literature/palladius/agr8.html#7) for "hydromel" (usually translated "mead," but in this case it's non-alcoholic! ), so I suspect it might be more common in rustic food. 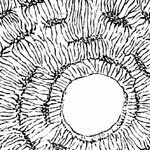 Furthermore, in early Jewish discussions of the Passover food ḥarosset, it is emphasized that it should be "sour like apples." Nowadays both apples and ḥarosset are thought of as sweet, but apparently in Roman times ḥarosset was tart, and apples could be unproblematically be used as an example of that flavor. I have more comments to make on the individual ingredients of your salad (though nothing negative at this point), but I'll have to save them for later. It's certainly a noble project to try to figure out this sort of sub-literary staple. Trimalchio's dinner in Satyricon has some amazing dishes. I like the stuffed pig story! Oh, and btw, my reference on hydromel above is incorrect: it's hydromēlum (an entirely different thing), and it's in the Geoponica not Columella. I only realized this because I'm making it this year!